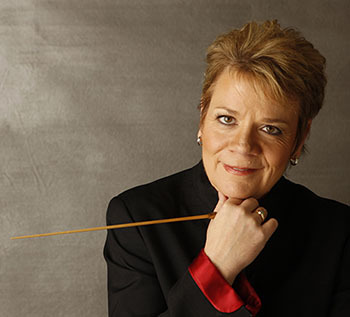 Marin Alsop is an inspiring and powerful voice who passionately believes that “music has the power to change lives.” She is recognized for her innovative programming and for her deep commitment to education and to the development of audiences of all ages. Her success as Music Director of the Baltimore Symphony Orchestra (BSO) has been recognized by the extension of her tenure until 2021. In Baltimore, Alsop launched OrchKids, for the city’s underserved youth, and the BSO Academy and Rusty Musicians programs for adult amateur musicians. She became Music Director of the São Paulo Symphony Orchestra in 2012 and becomes Conductor of Honor in 2019. Alsop becomes Chief Conductor of the ORF Vienna Radio Symphony Orchestra in September 2019. Alsop conducts the world’s major orchestras, including the Leipzig Gewandhaus, Royal Concertgebouw and the London Philharmonic orchestras. In September 2013, she made history as the first female conductor of the BBC’s Last Night of the Proms. As a protégé of Leonard Bernstein, Alsop is central to his 100th-anniversary celebrations, conducting Bernstein’s Mass at the Ravinia Festival, where she has been appointed Musical Curator for 2018. Her extensive discography has led to multiple awards and includes a highly praised Naxos cycle of Dvořák with the BSO. Her dedication to new music is demonstrated by her 25-year tenure as Music Director of the Cabrillo Festival of Contemporary Music and her launching the BSO’s New Music Festival in 2017. Alsop is the only conductor to receive the MacArthur Fellowship, and she was recently appointed Director of Graduate Conducting at the Peabody Institute. She attended the Juilliard School and Yale University, which awarded her an Honorary Doctorate in 2017. Music Director Marin Alsop dishes on Bernstein's Candide. Watch it performed by the BSO and guests including Patti LuPone during the 14-15 season!